And let me be clear, that BEFORE picture just happens to be taken after we did several coats of white paint. A pink bathtub surrounded by deep, dark brown walls & a ceiling equally dank is what we started with. Imagine the horror! Let’s move on to more pleasant things now. AFTER: Now, as you can plainly see, this bathroom is tiny. Chances are, you could probably use the bathroom, take a shower, and wash your hands and hardly move an inch! So of course, being the woman that I am, storage and functionality of the bathroom was something I was nervous about. 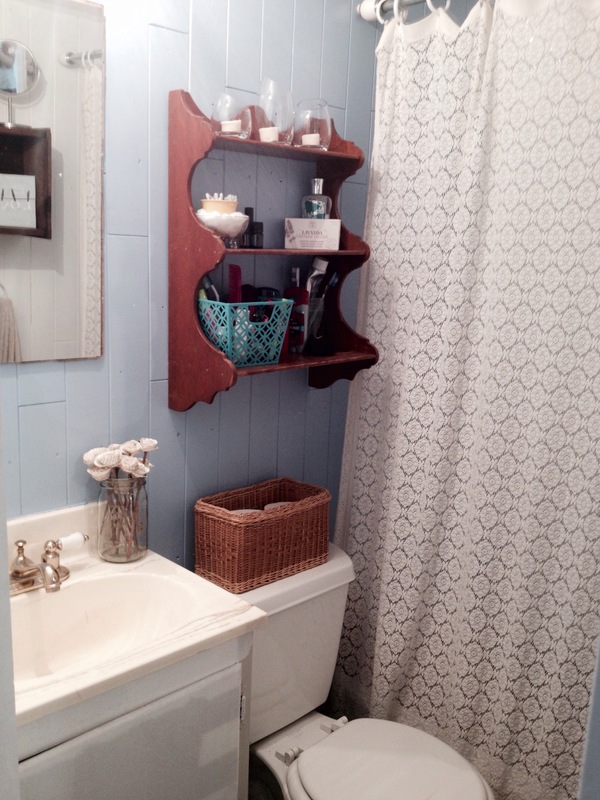 Especially when Ben, bless his heart, tore out all the shelving that bathroom had with the words “Trust me.” Well, that started fits in my heart, because how on earth could you make this bathroom, this tiny, despicable bathroom, anything good?! And Ben, being the awesome husband that he is, promptly kicked me out of the bathroom and made this his project. I was not to worry about it, not to look at it, not to think about it! And boy, was he right for tearing out all the initial shelves & making it his project! He created a lovely bathroom from bits and pieces that he found here and there. So let’s get a closer look at the bathroom, shall we? It won’t take long. It is tiny after all. Here you will see that Ben stained an old drawer and made it into a shelf. I added a small basket to the drawer just for a nice little touch. I have decided that baskets are marvelous for functionality & decor. Therefore, I used another basket to hold the toilet paper. And by George, I will be stocking this basket full of trusty TP when we have company about! You can never have enough toilet paper, in my humble opinion. Behind the pretty lace shower curtain is a very ugly pink bathtub (hey, it still works great…we’ll keep it! ), so to compensate for the ugly pink, Ben found this rustic heart and hung it on the back shower wall. I couldn’t be more pleased. 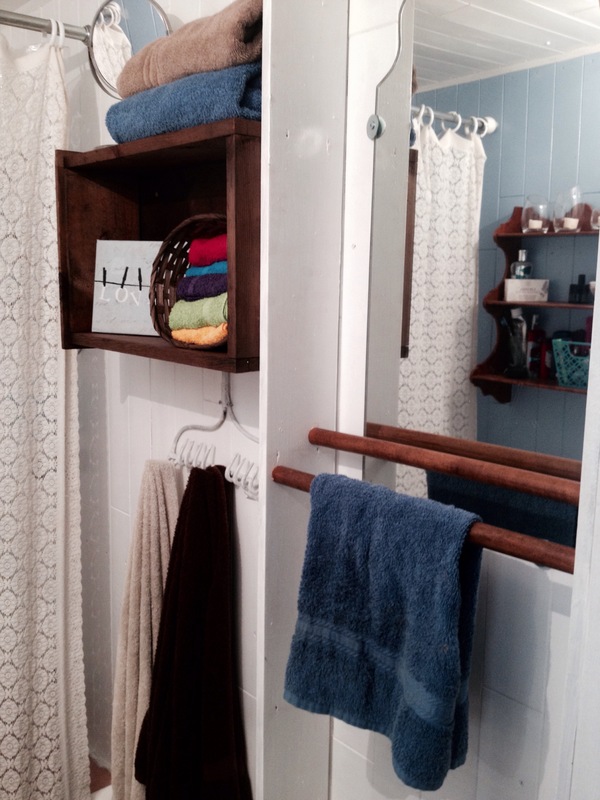 Oh and I can’t forget to mention that the drawer handle can also function as a towel hook (Ben’s idea)! If you need a towel close by after hopping out of the shower, well no problem! You’ve got one right at your disposal. It really works! But as I mentioned before, the bathroom is so small that you could reach for anything you needed, but it’s still a cool feature & should not be ignored! How about a closer look at that towel rack?! That husband of mine sure knows how to re-purpose old things! 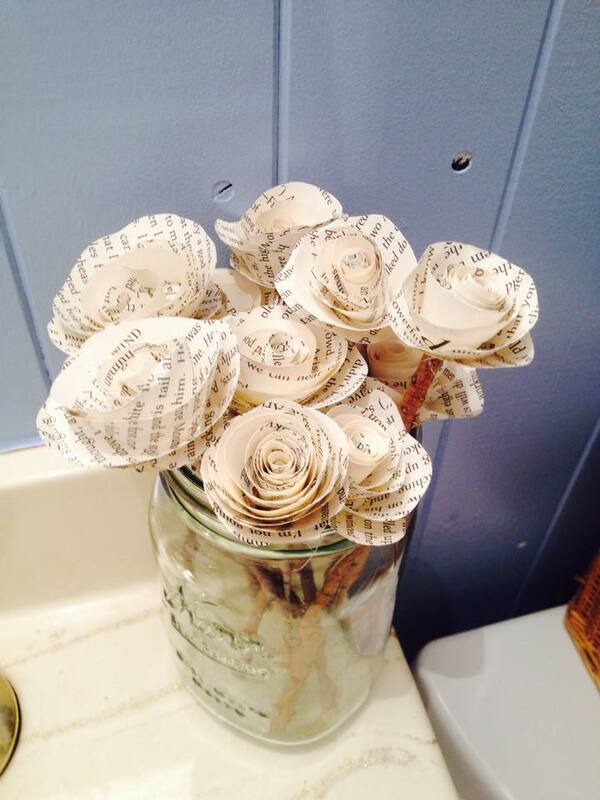 And of course, I had to add some of the paper flowers. It is a consistent theme throughout our home, and I’d love to claim that I had that as my plan all along, but when your wedding called for a hundred paper flowers that took a lot of work to make…you can’t just toss em’ out! So alas, they have become a staple part of our home decor. So there you have it! 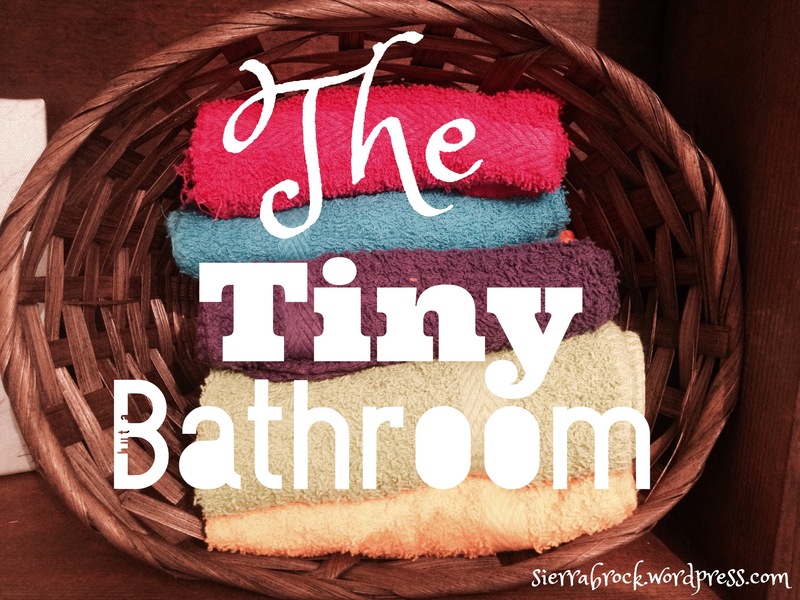 A tiny bathroom can function and it can become a lovely place to be! It just takes hours of hard work, a husband who kicks you out of the DIY project, then invites you back when it’s ready to decorate. I don’t even seem to mind the pink bathtub much anymore, there’s so many other pretty distractions. For pictures of our kitchen and living room, click here.